Hormann Hinged Door Range – The Biggest? Hormann are very well known in the UK and across the world for their garage doors, as well as for their industrial doors in the commercial world. Their biggest range of doors, however, is quite probably their range of hinged pedestrian doors, providing access, insulation and security. Several years ago, Hormann launched their range of ThermoPro Front Entrance Doors, followed by the release of their top-end aluminium entrance doors, which offer the ability to match your garage door with your front entrance door. The latter range of doors is somewhat smaller, but offers a mid-to-high range of specification, with a price to match. 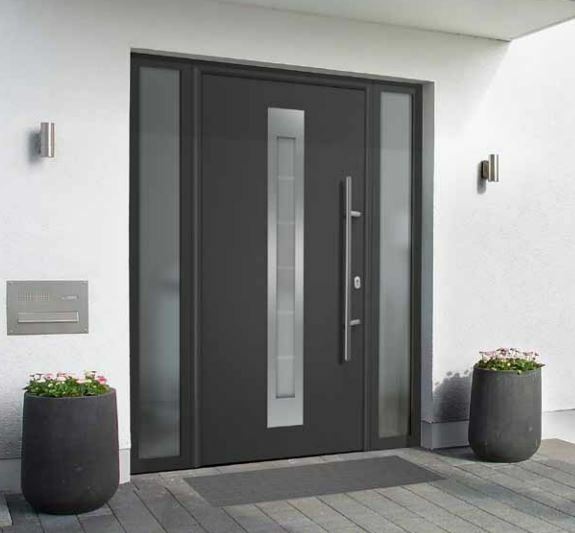 The ThermoPro range of doors is now well established in the UK market, and offers a selection of steel insulated doors with very high security and insulation qualities, as well as features including a super-low (10mm-15mm) threshold, triple glazing and (optional) electric opening functionality. The designs available cover traditional styles, but also offer contemporary and modern looks, all in a range of colours. Hormann’s aluminium range was relaunched last year, now including a large range of ThermoSafe, ThermoCarbon, and TOP Comfort bespoke doors. These ranges offer the highest levels of door performance, with some doors delivering astounding thermal values as low as 0.47W/(m2K)! These doors are able to be tailored to your exact specifications, with bespoke colours, glazing, locking, hinges, handles, side elements and so on. ThermoComp doors were also fully launched earlier this year, offering a range of composite doors. These high-quality offerings are all bespoke in sizing, with a full arsenal of accessories, side and top elements available to help create the perfect front entrance door. Whilst this may seem like a large number of doors already, there’s more! Hormann offer a range of domestic side doors, perfect for garage side entrance doors, available in single or double skin steel for different applications. These doors have also been designed to match the designs of the garage doors Hormann offer, allowing you to create visual consistency on your garage and property. There are also individual doors designed purely for domestic use; the KSI Thermo, the MZ Thermo, the H3D. There is also a fire-rated door for use between a house and a garage called the H8-5, and a security rated version, WAT. Further into the home, there is the ZK range, offering internal steel doorsets with attractive colour and woodgrain finishes. Hormann have recently launched a range of internal timber doorsets, which are poised to take the market by storm. The key word here is ‘sets’, as the doors come fully finished with a ready-to-fit sub frame and architrave set, along with all the appropriate furniture and locking. Rather than simply buying the door leaf, this set delivers the full package for installing a door and closing off a door opening. The range of doors, BaseLine, ConceptLine, GlassLine and DesignLine, will provide a vast range of traditional and modern internal timber doors, suited for any home. From solid timber to almost-completely glass doors, this range promises exciting new designs and finishes for internal doors. 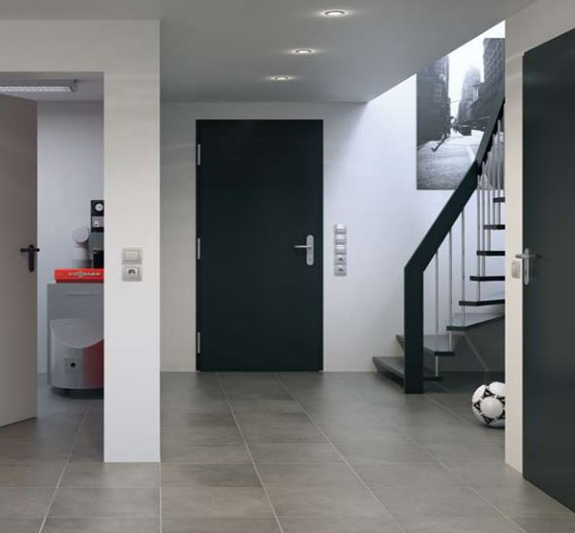 This just about covers the huge selection of hinged pedestrian doors that Hormann offer, but only for domestic applications. Commercial and industrial doors are also available, but that is a far bigger story, best saved for another day. Topics: Up And Over Garage Doors | Comments Off on Hormann Hinged Door Range – The Biggest?